An historic Manhattan mansion is home to this year’s Kips Bay Decorator Show House. 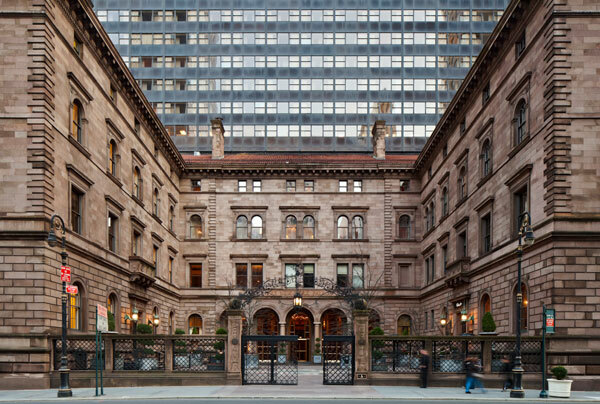 The Villard House, at 457 Madison Avenue, is an iconic New York City landmark and is set in the Neo-Italian Renaissance style. The distinguished architecture, along with its classically beautiful rooms, offers an ideal canvas for a premium group of hand-selected designers to showcase and donate their venerable talents. Their contributions not only feed and inspire the creative soul but also help to raise critical funds for the Kips Bay Boys & Girls Club, providing a very special enrichment program for the region’s youth. As part of Blog Tour NYC, I was very fortunate to visit and absorb this celebration of imagination, style and design. Each room was a feast to the senses and set the design wheels turning into beautiful motion. What incredible expression and inspiration! Upon entering the kitchen of Matthew Quinn, I was instantly charmed. It was quite a memorable part of the exhibition for me. The large light-filled space hits an overarching note of modern classicism in a most refreshing and uniquely expressive way. I love to hear the story and inspiration behind a design concept. Every great space has one. I had the opportunity so speak with Matthew about the genesis and evolution of his beautiful room. He told me that when the room was just an empty canvas, he was led by its direct views of St. Patrick’s Cathedral. 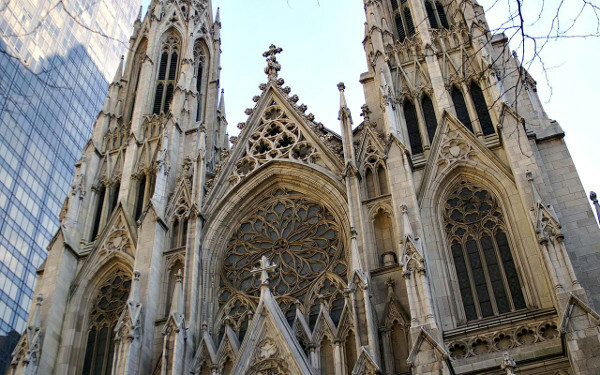 The gothic quatrefoil detail is therefore given reinvention. A half quatrefoil in tracery is introduced on the glass doors of the striking custom display and storage units which flank the dinette window. In order to maintain a fresh and unfettered appeal, Matthew introduced a high gloss white lacquer finish. The result is simply divine, I would say. 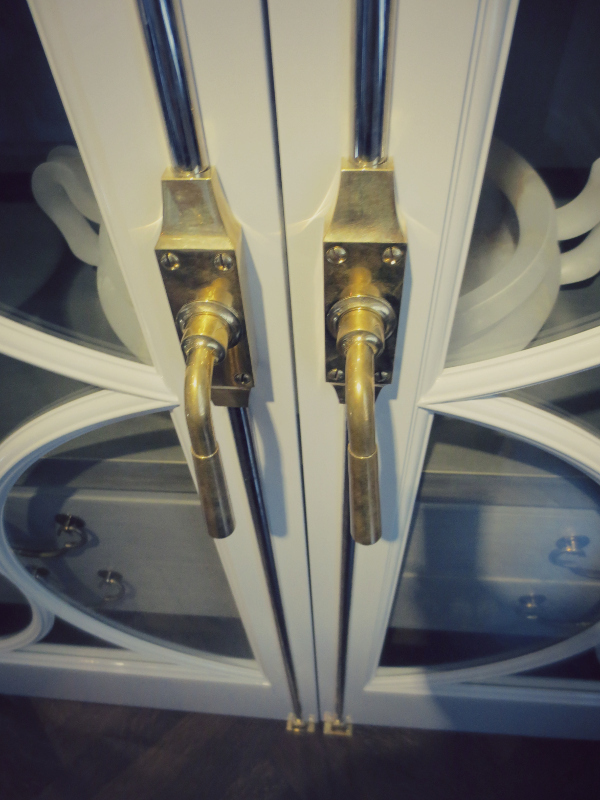 There is nothing too traditional in this approach and it frees up the pieces to receive bespoke brass pulls as would typically be seen in a grand old fashioned home. I believe this is where the root of the design ethos lies. There is a certain intrinsic thread of classicism set within an eclectic and modern sensibility. Old and new elements have been perfectly assembled as if they were always intended to be together. This is the refined art of eclecticism. It’s somewhat quirky yet holds a sense of timeless appeal. 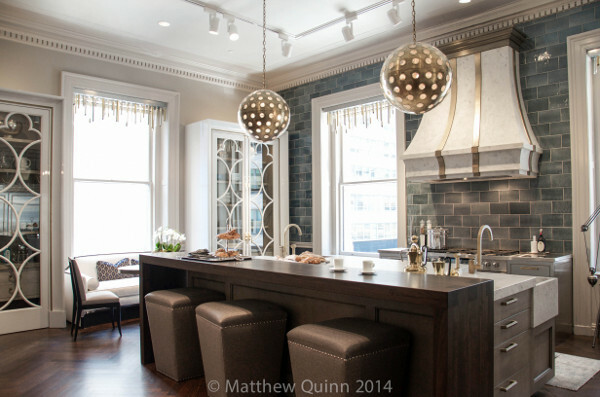 The finishes and materials and attention to detail are what speak of luxury in this kitchen. I adore the herringbone hardwood. 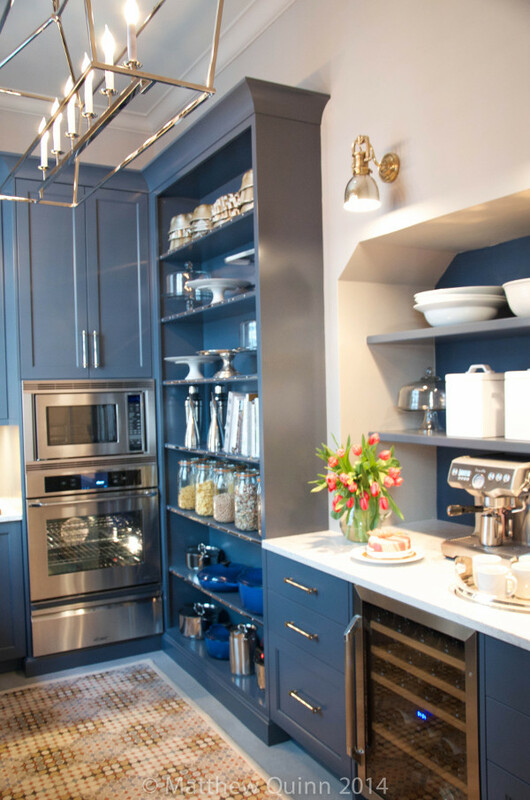 It’s the perfect grounding for a muted blue-gray perimeter in cabinetry. Did I mention the interiors of the cabinetry are of walnut and stainless steel? A suede-finished Helix Silestone for the counters and corner apron sink is both maintenance-free and gorgeous. The mixing of metals is another key strategy to this space. A harmonious composition of un-lacquered brass, stainless steel and polished nickel offers beautiful balance and interest. 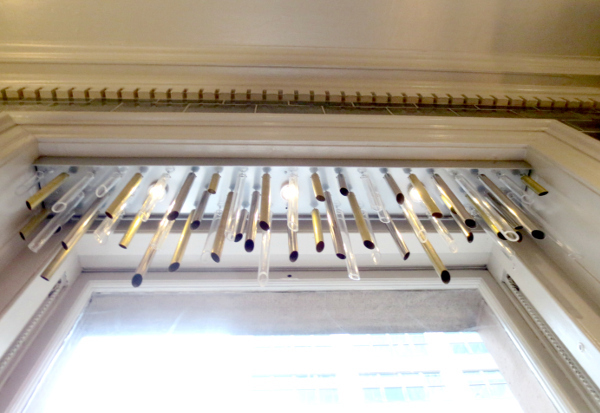 I was particularly impressed with the pipe-organ window treatments. Again, this is an inspiration derived from the Cathedral views. It gives the windows such incredible appeal in terms of geometry and texture. The custom range hood of sculpted stone and brass floats amid blue ceramic glazed subway tiles and is a real showstopper! 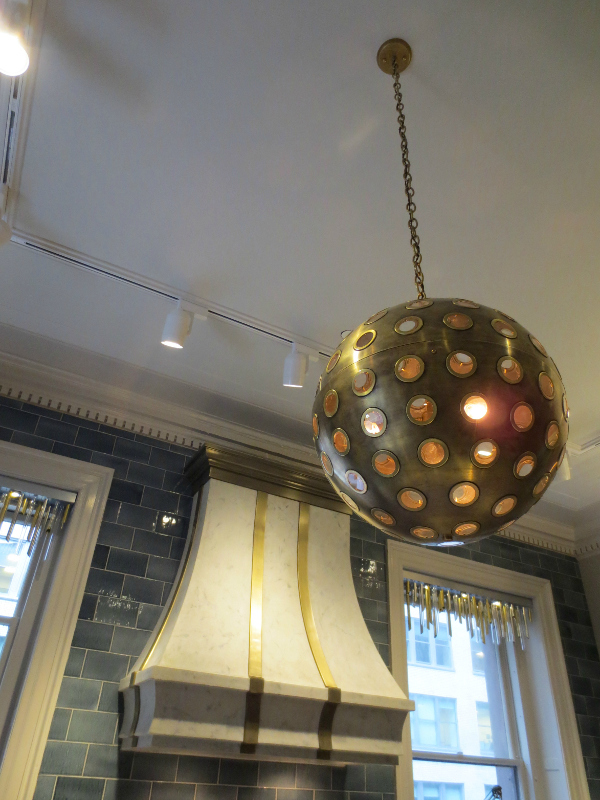 Large brass orb pendants hanging above an oversized island give an industrial nod and are true statement pieces suspended from the 13 foot high ceilings. I’m in love with these fixtures! The scullery is an adjoining room of beautiful display and function. It’s a more intense version of the larger kitchen space with mineral blue cabinetry and sparkling detail in lighting, fittings and hardware. I love the polished nickel shelf fronts, the display of vintage cake forms and Matthew Quinn’s Industrial spray faucet which sits in front of a wonderful window lined with herbs. 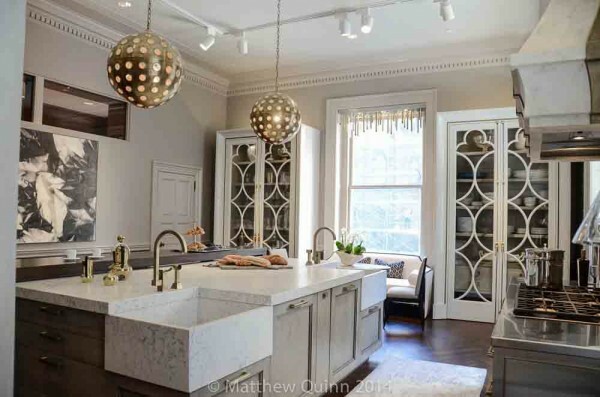 Matthew Quinn’s kitchen and scullery are rooms composed of beautiful materials, imagination, reinvention and craftsmanship. It’s part of one very exquisite exhibition. I feel that this historic mansion on Madison holds a certain magic within its walls. Each great design talent must have been held under its spell since this year’s Kips Bay Decorator Show House expresses pure beauty. Regina Sturrock is the owner and principal designer of Regina Sturrock Design, a Burlington, Ontario interior design firm now in its eighteenth year. Specializing in renovations and new- builds within the luxury home market, the firm’s projects have spanned internationally. Born in Graz, Austria, a city steeped in old world culture, Regina understands how the human spirit responds to the ideals and beauty of classical design. Regina defines interior design as the art and science of bringing our surroundings into harmony with the unique spirit and personality of the individual within their space. Customization is therefore the hallmark of every Regina Sturrock Design project, and the result is always uniquely beautiful, practical and elegant with a strong focus on an integrated architectural envelope. 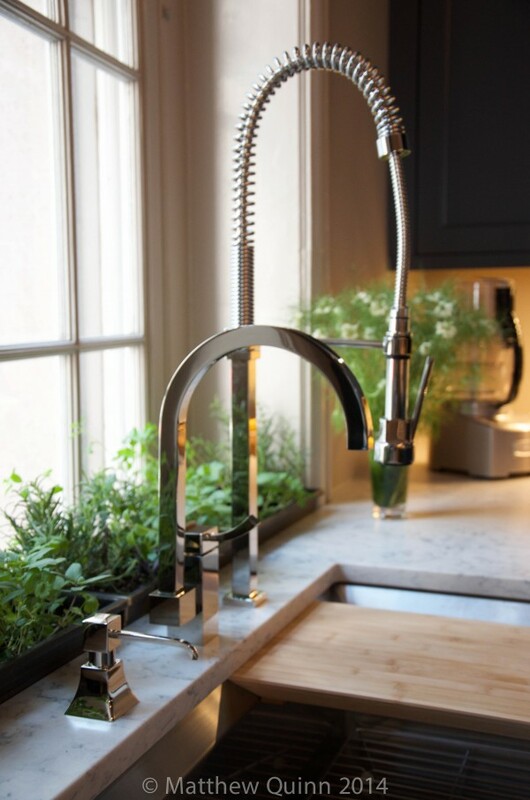 The shimmering tall Goccia sink and matching faucet caught my eye. It’s high and stylish and would work with both traditional and contemporary design….